The standard process of generating antibodies using HuCAL technology involves seven steps. Fig. 1. 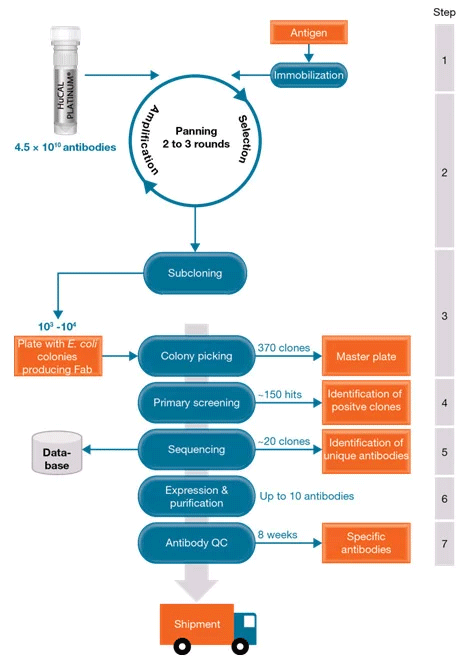 Summary of the standard custom antibody generation process using HuCAL. The antigen is supplied by the customer or can be made by Bio-Rad as part of the custom service project. The first step in antibody generation is the immobilization of the antigen on a solid support. The antigen is adsorbed to polystyrene ELISA microtiter plates, or covalently coupled to magnetic beads. Antigen presentation by passive adsorption may be beneficial for certain applications and is the best option if the antigen is in a buffer incompatible with the bead-coupling chemistry. With HuCAL technology only 0.5 mg of protein antigen is required for the entire project from antibody panning to screening and further characterization. The HuCAL library presented on phage is incubated with the immobilized antigen. Non-specific antibodies are removed by extensive washing and specific antibody phages are eluted by adding a reducing agent. An E. coli culture is infected with eluted phage and with helper phage to produce phages representing an enriched antibody phage library for the next panning round. Typically, three rounds of panning are completed. Fig. 2. Phage Panning. Selection round of phage-displayed HuCAL Fab fragments on antigen-coated magnetic beads. During the three rounds of panning, guided selection can be employed to select highly specific antibodies from the library. For example, we can design strategies that result in antibodies that recognize a modified epitope, distinguish between antigens that differ by only a few amino acids, or that bind to the idiotope of a monoclonal antibody drug. These requirements are very difficult to achieve using conventional antibody generation methods that rely on animal immunization. This powerful process is one of the advantages of antibody selection in vitro. After panning, the phagemid DNA encoding the enriched antibody population is isolated as a pool and subcloned into a Fab expression vector. Different vector formats are available for expression of monovalent or bivalent Fab fragments with a choice epitope tags. E. coli are transformed with the ligation mixture and plated on agar plates. Each growing colony represents a monoclonal antibody at this stage. Colonies are picked and grown in a 384-well microtiter plate. Antibody expression is induced and the culture is harvested and lysed to release the antibody molecules. Culture lysates are screened for specific antigen binding by indirect ELISA. 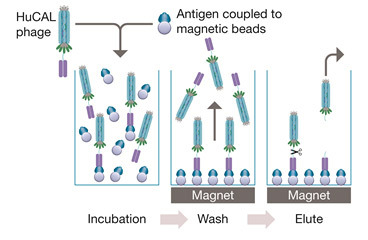 Alternatively, screening can be carried out on antigen coupled magnetic beads, for instance using the Bio-Rad Bio-Plex® Multiplex Immunoassay System, or high throughput flow cytometry screening on cells can be performed to identify antibodies that detect the native antigen on cells. A secondary screening step offers the option to further filter the primary screening hits for certain characteristics. Two options for a secondary screening are currently available: off rate screening to select according to binding strength, and western blot screening to identify antibodies that detect the antigen in western blots. Hits from the primary or secondary screening experiment are sequenced to identify unique antibodies. The sequences not only guarantee the uniqueness of any HuCAL antibody obtained from the panning, they also serve as an ideal antibody storage backup and a guarantee of reproducibility. The Fab antibodies with unique sequences are expressed in E. coli and purified using one-step affinity chromatography. 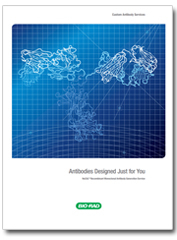 Purified Fab antibodies are tested by ELISA for required specificity. Purity is assessed by SDS-PAGE and concentration is measured by UV absorbance at 280 nm. Additional QC assays and cross-reactivity testing can be performed depending on the project requirements. For a standard project, purified Fab antibodies are typically dispatched 8 weeks after commencement of a project. The typical number of antibodies dispatched will vary according to the type of custom package selected. The custom HuCAL recombinant monoclonal antibody service is tailored to your project needs. The standard panning service is described above and additional services can be added. Working with you, our technical specialists provide expertise to design a project to generate and characterize the antibodies you need.